Color and B&W photos (wares and seals), line drawings (teapots), bibliography, index of potters, general index. Twenty years after its publication, this book remains the single most important English language reference on Yixing. Kwee Seong Lo’s scholarly approach and chronological progression of the text enable readers of English, for the first time, to understand many of the nuances and traditions of Yixing ware, with no aspect overlooked. An absolute imperative addition to any Yixing library. Exhibition catalog. The Art of the Yixing Potter: the K.S. Lo Collection, Flagstaff House Museum of Tea Ware. Hong Kong: The Urban Council, 1990. With text in English and Chinese, this exhibition catalog describes Yixing stoneware, its history, some Yixing collections, and the collecting of such ware in the West. This work looks at tea drinking in China and offers a concise history of Yixing Ware, the collection of Yixing Ware in the Shanghai Museum, as well as Yixing and the West. Complimented by profuse photographic illustrations showing good examples of the pottery. 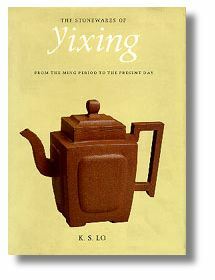 Three Techniques of Making Yixing Teapots, dustjacket protected, quarto. Published by Urban Council, Hong Kong. 250 pp. 31 x 25 cm. Unfortunately, this book is currently out of print.